The winning team!Bangor University recently celebrated cultural diversity and collaboration with its annual action packed Culture Challenge. 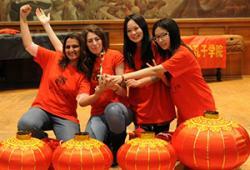 The Culture Challenge, organised by the University’s International Student Support Office, in partnership with the Bangor Confucius Centre, is a great way for Bangor students from different backgrounds and nationalities to meet up, make new friends and work together as a team to compete for the first prize of a trip of a lifetime to China. Nine teams competed this year; the first part of the Challenge was to find a creative way to present the culture of one or more of the team members’ native countries to a panel of six judges. The second part of the Challenge the teams had to answer questions about issues from Wales, the UK and China. This year’s judges were Dr David Joyner, Executive Director of the Bangor Confucius Centre; Alan Edwards, International Student Support; Gwenan Hine, Senior Assistant Registrar; Nick Parker, IELTS Office, Fiona Watkins, Halls of Residence and Shân Rees Roberts, Corporate Communications and Marketing. The winning team was Zahirah Mohamad Khimani, 26, from Pakistan who is studying for an MSc in Clinical Neuropsychology; Zhang Qihrili, 19, from China who is studying Accounting and Banking; Abigail Price, 24, from Wales, a Bilingualism PhD student and Wai Yu Cheung, 22, from Hong Kong who is studying for an MSc in Applied Behavioural Analysis. The team members had not met prior to entering the competition, but during the process of preparing for the challenge they have learnt about each other’s cultures and made lifelong friendships. The Confucius Institute is a portal for understanding and collaboration between north Wales and China, and part of a global network of over 400 Institutes. Established in Sept 2013 in partnership with a top Chinese University – the China University of Political Science and Law – the Confucius Institute provides Mandarin language courses and promotes China/Wales cultural exchange widely across the region.